It is iOS Brief Technical Details as we are not going to discuss on the Graphical User Interface part. iOS unveiled in 2007 as iPhone OS for iPhone by Apple inc. We wrote a lot about various Computer Operating Systems, it is not a bad idea to continue our long ago discussed topic on iPhone and iOS. Practically the linked article was published right one year back. In this one year, we have covered some basics on developing iOS Apps with many articles like How To Start Developing iOS Apps, Creating RESTful API for Your Self Hosted iOS App, Blueprint for Creating an iOS App from RSS Feed – to cite a few. Apple revealed the existence of iPhone OS on the Macworld Conference & Expo on 9 January of 2007 , but the system had no official name until it came as the first beta on March 6 , 2008. Before this, it was considered that OS X is just running on iPhone. The launch of the iPhone OS took place on June 29 , 2007. The name was iPhone OS 1.x. iOS 4 was made available to the public for the iPhone and iPod Touch on June 21, 2010, still then it was iPhone OS. Apple announced iOS 7 on June 10, 2013 at its annual Apple Worldwide Developers Conference (WWDC) event. iOS is straightforward derivative of OS X technologies, means UNIX OS and Cocoa Touch is the programming framework. Technologies co-shared between iOS and OS X include the OS X kernel, BSD sockets for networking and Objective-C and C/C++ compilers for native performance. 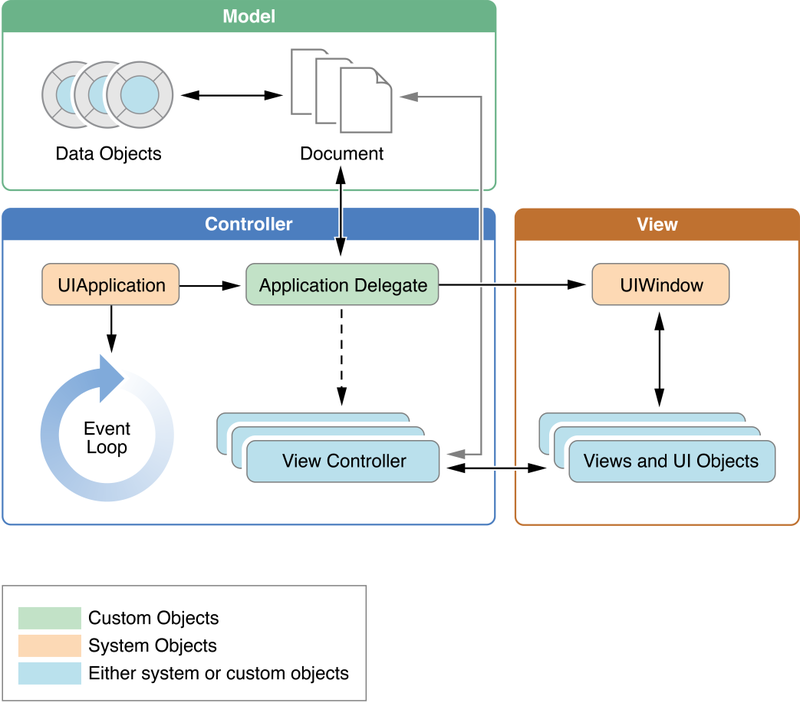 iOS is built upon Model-View-Controller paradigm. Lot of useless information can be found on Wikipedia. Skeuomorph is a terminology, which is used in prototype and production designing and development. Example can be – a retro telephone vector used as icon for Internet Telephony application. There are lot of such examples like Faux wood effect on car dashboard, retro knobs on Computer Music Player applications etc. Skeuomorph are deliberately employed to make the new look comfortably old and familiar. This is the basic need to know about the designing part of any iOS App. Core Data provides a flexible and powerful data model framework for building Cocoa applications based on the Model-View-Controller (MVC) pattern. Core Data provides a general-purpose data management solution handle the data model needs of every kind of application, large or small. You can build anything from a contact-management application to a vector-art illustration program on top of it. iOS uses SQLite library, a powerful relational database engine that is easily embedded into an application. iOS supports HTML5 offline data storage features. The offline storage means a web app can store session data locally in a cache on the iPhone or iPod touch device, using either a simple key/value data API, or a more advanced SQL interface. Our iOS Brief Technical Detail ends here and in near future we will discuss a very interesting topic for the web masters. This Article Has Been Shared 5647 Times! Cite this article as: Abhishek Ghosh, "iOS : Brief Technical Details," in The Customize Windows, March 2, 2014, April 21, 2019, https://thecustomizewindows.com/2014/03/ios-brief-technical-details/.